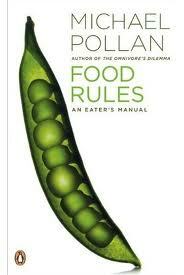 a book chick: "food rules"
my take: i read the omnivore's dilemma a couple years ago (my copy is at lakewood family medicine if anyone finds it) and was challenged, enlightened, disheartened, and inspired by michael pollen's work uncovering the real story behind our food. he summed up how therefore to live in seven words: eat food, mostly plants, not so much. so simple! his food rules is an small expansion on that advice... revisiting the questions that he answered in those seven words: what should i eat? what kind of food should i eat? how should i eat? the 64 rules are often pithy (#11 "Avoid foods you see advertised on television"), brief ( #18-21 give no further instruction), and profoundly common sense-ical (#60 "Treat treats as treats.") ... making this a book i read in about half an hour and giving me food for thought for a lifetime. some rules i found pretty easy: # 4 "Avoid food products that contain high-frutcose corn syrup." i'd been working on that already. some are obviously true but maybe i cheat a little: #21 "It's not food if it's called by the same name in every language. (Think Big Mac, Cheetos, or Pringles.)" i admit to eating a Pringle on an airplane when nothing else is available. and one that i really need to work on: # 50 "'The banquet is in the first bite.'" lots of great take aways. easy to consult. lots of sound science behind the suggestions. i plan to work on a few, master them, and do some more. my source: i hate to admit it, but i discovered this while surfing around amazon.com. i do buy lots of books at indie stores! my take: great food wisdom. must read for those interested in health. Also, some of those pithy food rules would be great commandments for the Happiness Project - she does one of "eat only real food", I think I remember.